Ahead of the Wooden Spoon 2015 Arctic Rugby Challenge 15 brave men gather in Wales on the sand dunes of Merthyr Mawr Warren after completing a gruelling weekend of training. The session will be their last before they depart for the Magnetic North Pole in what will be a world record attempt. The two teams are now prepped and ready for the challenge that lies ahead. 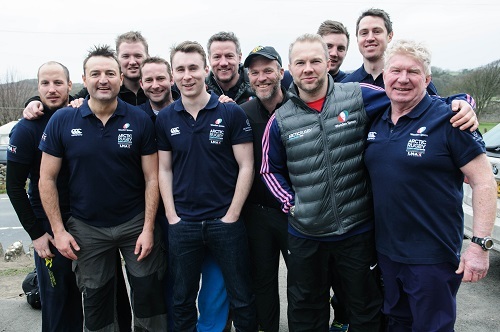 The challengers at the training weekend in Wales – L-R Stephen Henry, Paul Jordan, Steven Turnbull, James Harding, Fergus Davidson, Tim Stimpson, David Mercer, Ollie Phillips, Andrew Walker, John Houston, Jock Wishart. 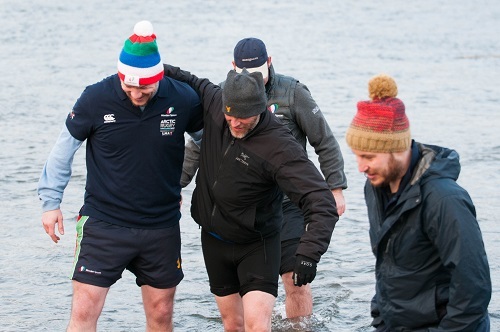 In April, Wooden Spoon ambassadors and former Rugby Union Internationals Tim Stimpson formerly of England and Leicester Tigers along with Ollie Phillips ex England 7s and Gloucester winger will lead two teams of brave individuals on a pioneering expedition to the Magnetic North Pole. Former England and British Lions player, Lee Mears will also join the teams in the North Pole as match referee. With the help of world-class polar adventurer, Jock Wishart, the teams will travel up to 100 miles to one of the furthest places north on the planet. Once the teams arrive they will take part in the northernmost rugby match in history, captained by rugby legends, Tim and Ollie. The expedition runs from 15th April – 15th May 2015. The public can get involved in the conversation by tweeting @wsarcticchallenge and tweet messages of support to each team using the hashtags #teamtim and #teamollie. The project aims to raise £300,000, which will go directly towards helping disadvantaged children and young people throughout the UK and Ireland. Captain, Ollie Phillips said “What an amazing challenge to be a part of, a truly one in a life time experience”. Opposing captain Stimpson said “We’ve had a brilliant weekend of training, it was a very tough test and Jock pushed us hard but it was exactly what we needed with only a few months until the expedition”. Polar explorer Jock Wishart who put the teams through their paces commented saying “Training has gone really well, it was a challenge for all the guys but one that they’ve passed and everyone’s in a good place”. And to donate Text Code ARCT01 £2, £5 or £10 to 70070. This entry was posted in Featured, Land Sports, News and tagged Arctic Rugby Challenge, Rugby, Wooden Spoon. Bookmark the permalink.